Today’s COOL SCHOOL is Rene Rost Middle School in Kaplan! Back in October, 8th Grade TAG students that attend Rene Rost Gifted Center decided to raise money for the cause of Breast Cancer. They created banners, posters, and even educational presentations that teachers could share with their students. Each morning, students would walk around the gym collecting donations for this cause. 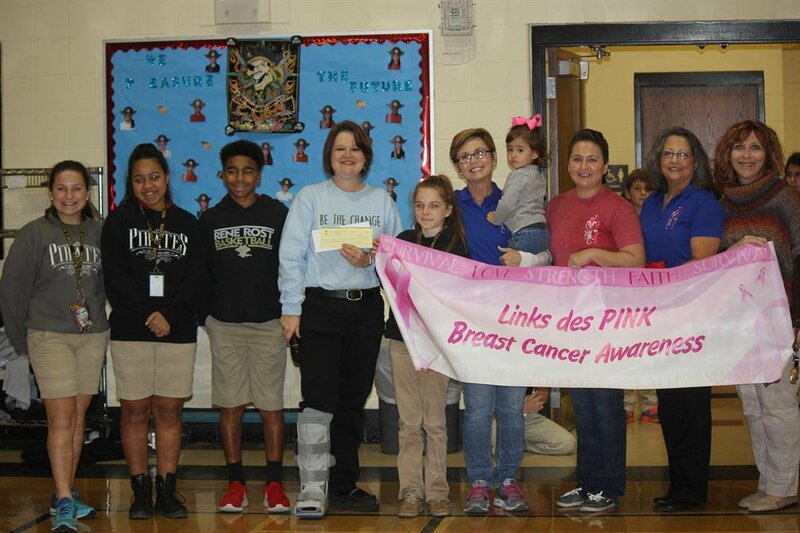 They sponsored a Breast Cancer Dress day where students donated money to wear jeans with either a pink shirt or a breast cancer awareness shirt. Altogether the students collected $469.00. This money was presented to Links des Pinks. We are proud of our Pirates! If you have a COOL SCHOOL let us know! Send Dave Baker an email to weather@katctv.com. Put COOL SCHOOLS in the subject line. Include a picture and a short story about why your school is COOL. We do COOL SCHOOLS every Monday, Wednesday, and Friday. Please join us for our April Links des Pink meeting – Tuesday – 4/12 at 6:00pm – El Camino.